Our mission is to provide an excellent undergraduate life sciences education in the liberal arts tradition. 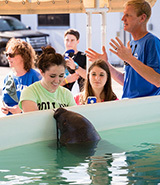 The curricula of our three majors, Biology, Marine Biology, and Biochemistry-Molecular Biology will expose you to a wide variety of classroom, laboratory, and field experiences fundamental to the life sciences, enabling you to think critically, learn technical skills for solving biological problems, and to communicate biological information both in oral and written formats. You will begin to learn global citizenship from the moment you enter a biology classroom. The introductory biology course sequence, General Biology I&II, address global climate change and human health issues that impact everyone. 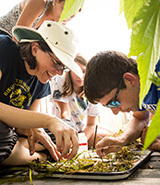 Upper level major courses provide embedded authentic research experiences, stimulating inquiry and analysis, while educating you to think critically about the world around you. This includes integrating content taught in classes within the context of real-world environmental and health issues. You will encounter a developmental curriculum that emphasizes scientific literacy, effective communication, collaboration, critical data analysis and the ability to synthesize separate observations into a coherent “big picture”. You will learn how your actions influence the world around you and to think creatively about solutions through both egalitarian team efforts and leadership roles. You will develop discipline-specific written and oral communication skills through laboratory papers and oral presentations of student generated data. By holding you to a high standard of personal integrity, self-awareness, vision, imagination, and action, our curriculum promotes responsible leadership and the capacity and confidence to tackle the biggest societal and environmental problems. You will learn to integrate the scientific method into making sound, data driven conclusions across all disciplines. You will be prepared to pursue productive careers by engaging in intentional conversations and experiential learning directly with faculty members. Communication is an essential factor of a scientific career. Your written and oral skills will develop through the systematic examination of primary literature and data followed by discussion of these topics in both formal and informal capacities. 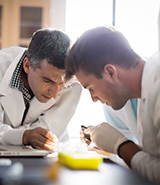 To enhance your career preparation, the department will encourage you to take Careers in Biology where you will learn to write customized resumes and cover letters, find and apply for internship and volunteer opportunities, as well as interact directly with professionals in various biological professions. We strive to enrich the meaning of your life by promoting life-long learning about the natural world through an intentional focus on scientific literacy and objective problem solving.